India Couture Week this 2017 took place on 24th - 30th July, concluding with a glamorous Manish Malhotra show that was simply spell-bounding. ICW had the country’s top designers showcasing the latest bridal and evening wear for this season. 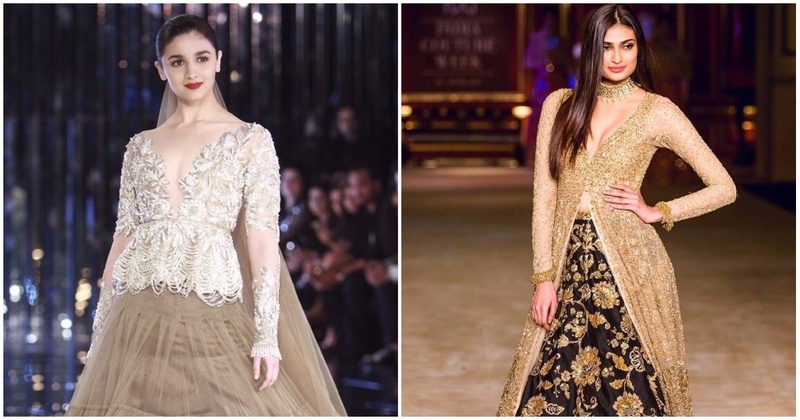 From Rohit Bal to Tarun Tahiliani, each of them wowed us with gorgeous outfits that made us wish we could own them all! The collection, titled ‘The Sensual Affair’ comprised of silhouettes that were voluminous and flowy, with billowing skirts, long capes, fringed blouses and sleeves with an air of western regality. Alia Bhatt looked super-stunning as the show-stopper in her princess-worthy outfit of sparkling crystals, a 3D-rose-embellished hem and a long, long train. Titled ‘Shahaan-e-Khaas’, this royal collection was an ode to the Mughal era, with their regal silhouettes and rich colour palette. Rohit Bal beautifully combined traditional Mughal details with a hint of contemporary. Focusing on 16th century Rajasthani art, Anju Modi used a colour palette of pastel and bright colours with the occasional pop of rich blue and red. Dia Mirza looked like Rajasthani royalty in a deep-toned lehenga with rich ruby and emerald hues. The velvet blouse with silver embroidery complimented beautifully complimented her jewellery. This collection by Tarun Tahiliani was all about elaborate drapes and vintage embroidery with a range of colours from ivory and pastels to warm reds and oranges. This season’s Shyamal and Bhumika collection was a blend of contemporary, glamorous and elegant. Stunning gowns, jacket-lehengas, cape blouses and mod sarees highlighted the glamorous range. Inspired by Czech painter Alphonse Mucha, this collection by Varun Bahl was a refreshing change from elaborate bride wear to delicate florals in light, flowy fabrics like chiffon, tulle, satin and silk. Manav Gangwani’s gorgeously elaborate collection called ‘India@70’ was an ode to Indian culture, right from Kathakali-inspired embroidery to Mughal prints. We loved the edge to each of the ensembles that went beyond just contemporary.